It relates to a similar type of equatorial mounting structure – allocated on a pedestal – interlocked a circular concentric sector for the transport of the paraboloid from East to West and viceversa. The paraboloid carries laterally – only one side – one or more concentric circular sectors to the paraboloid that slide on guidas – circular arc shaped – so as to be revolving to the North-South and East West axes of the concentrator at a costant rate of 15° per hour and solar declination of +- 23° 27’. Therefore it’s a simpler structure and like the above said (Fig. 1, 1a) it’s equally steady. The rotating sectors (t), as well as being subject to the traction of (m), are also halted by the stops (Ts), placed in a way so that said sectors can rotate only in one direction, when hit by the wind that wins the resistance of (m) Fig. 2a TAV.2. b) Carrying structure (T) supporting the rotating sectors (t) Figs. 1-2-2a-3-5. In the presence of strong wind the systems (t) carry out a rotation around the axes (A) & (a) to make the wind flow away so as to reduce the impact with the carrying structure (T); When the strong wind ceases, the tie rod systems (m), force the rotating sectors (t) to return to the starting position, Figs. 2-2a-5. d) The hinge system (n) Fig.5, can be proposed as an alternative to the axes (A) & (a) on which occurs the rotation of the sectors (t) Figs.1-2-4, so as to claim a). The ends of the hinge (n) are steadily linked: on one side to the carrying structure (T) and on the other one to the rotating sector (t), Fig.5, so that it can rotate in both ways, around the hinges axes; with this arrangement, the ends of the rod system (m) Figs. 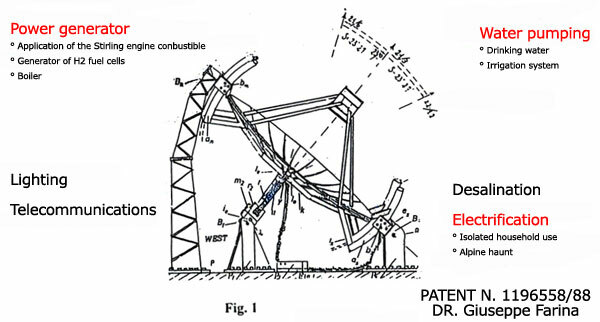 2-5 must be linked differently, between the carrying structure (T) and the one of the sector (t), so as to force the rotating sector (t), in absence of strong wind, to return to the starting position of the parabolic concentrator (C) Fig.3. The paraboloide carries laterally only one or more concentric circular sectors ( an, as ) which slide perfectly inside the guides ( bn, bs )- circular arc shaped-so as to be revolving around the North-South and East-West axes of the concentrator at a costant rate of 15° per hour and +- 23° 27’ declination, to track the apparent motion of the Sun. The declination axis, is perpendicular to the polar axis. Movements about this axis occurs slowly and varies by +- 23° 27' over a year.